Make use of the Law of Attraction – “Thoughts become things” – This one can be true if you full understand it’s meaning as you can read in my blog here. It has it’s place, but that place isn’t all alone as your guiding principle for success. Does that sound pretty close? We’ve all heard that stuff to some extent and obviously I’m going to now tell you that’s mostly wrong and half-true at best. Do you think Sidney Crosby or Alexander Ovechkin do the same thing every morning or before hitting the ice? What about Warren Buffet? Does he sit down every morning and tell himself he’s the greatest investor in the world? Of course not (though they may visualize taking a game winning shot, or negotiating a billion dollar deal but we’ll get back to visualization in a different blog). That’s ridiculous. Why don’t they do that? Because they already know it to be true. They know this in both their conscious and sub-conscious mind. In other words – they know logically and instinctively they’re great at their given profession because they’ve already proven to themselves (and the rest of the world) that they are. Ok, but maybe they’re great because ever since they were little they told themselves they were. Of course we’ve heard of the professional athlete who predicted as a 10 year old he’d be in the NFL. But then again which 10 year old doesn’t think they’ll be a professional athlete? Sorry, that’s not enough. Michael Jordan was cut from his high school basketball team as a sophomore. Think that helped his self-esteem? So did he sit around for the next year telling himself he was a great basketball player? Of course not, he went out and practiced until he actually was a great basketball player. And he kept practicing, and kept working hard until he was arguably the greatest athlete to ever pick up a basketball. 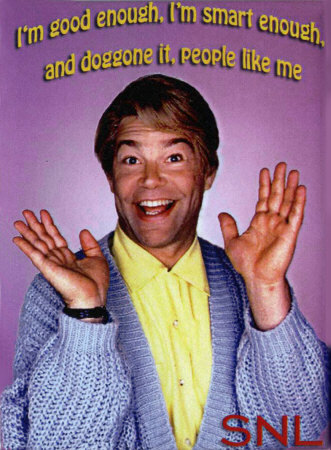 Even the self help genius, Stuart Smalley, didn’t quite understand why Michael didn’t need affirmations. Are you starting to see the failed logic of the self help “guru’s”? They tell you to tell yourself that you’re great before you ever are. Sorry to break it to them, but your mind knows the difference between truth and fiction. Even worse yet, as a general rule, your mind will reject the fiction and you’ll be no better off. You can NOT be anything you put your mind to. Sorry, your mom is flat out wrong. Think about it for a second, there are only a mere fraction of human beings every physically or intellectually capable of becoming Olympians. I say intellectually because you can be the greatest physical specimen the world has ever seen, but without discipline you’ll never be world class. We all can’t be Einstein’s. Doesn’t matter how good you are at high school physics or how long you study, it’s just not possible. If you need more proof than simple appeals to logic, read, First, Break All the Rules: What the World’s Greatest Managers Do Differently by Marcus Buckingham. With very exhaustive research, he demonstrates why your mom’s words of encouragement are not at all realistic. Instead he points out that by a combination of nature and nurture we are predisposed to be good at something. Figuring out what that is, is obviously the trick. Lying to yourself is just plain silly. Noah St. John points this fact out in his book, The Secret Code of Success . He suggests that if you tell yourself every morning that “I’m rich” and you aren’t, your mind knows the difference and you won’t just become rich. Instead he claims that your mind prefers to look for solutions to problems. In other words, if, instead, you ask your brain, “Why am I so rich?” every morning, your brain will instinctively try to find the solution to that problem. He has plenty of anecdotal evidence though no real scientific studies to back up his assertion. In my book, that makes a LOT more sense to me than lying to yourself. Confidence comes with experience. Two weeks ago I went on my first off-road mountain bike ride in about 5 years. Our trail was one of the top 50 ranked trails in the US called “The Alien” in Aztec, NM. The trail was a complete blast to ride, but I must admit there were some hairy parts. It’s mostly single-track and you spend a lot of time looking into canyons, riding between large boulders, and trying not to lose your traction on desert sand. Lizards regularly run across the trail. My guide was a friend who has quite literally ridden the trail about 50 times. He even completed a race on the trail less than 2 weeks before. He also just happened to be a national BMX champion in his youth. He has half a room filled with biking trophies. In the particularly scary parts of the trail, of which there were really only 2, he warned me ahead of time. He could ride the trail with his eyes closed (actually he does often ride it at night) but he knew I was on a new bike on a new trail doing something I hadn’t done regularly for a decade. I was a bit nervous. He was not. He had mastered the trail. I was just glad I hadn’t wrecked. He had immense proficiency due to years of riding in general and in particular on this precise trail. I had neither. No matter how much time I spent that morning, or even for the last 10 years, telling myself I was a great mountain biker I wasn’t going to do as well as him. On the other hand, I promise you, he didn’t expend one ounce of mental energy “affirming” for himself that he was a great rider that day. Confidence comes with practice and experience and not with mental repetition (visualization is something entirely different). They are naturally positive, confident, and good at things that bring success such as public speaking, learning, negotiating and leading people. Or they have some of those qualities and taught themselves the others. Since much of it is natural, they can’t ever figure out why other people aren’t that way and so just guess that if everyone else repeated to themselves daily what these guru’s already know to be true about themselves, they’ll improve themselves. Seems like a somewhat logical guess. Unfortunately, it’s wrong. They don’t really dig deeper. By that I mean they don’t read and research the books and studies that attempt to explain the human mind and soul and so never get a full picture of what they themselves are probably doing naturally. In other words, if you aren’t wealthy, popular, successful or a star athlete but want to be, you need to learn what people who are the those things are doing. You need to know what they know. You need to know how they came to know it. You need their knowledge and eventually experience and skill. Once you have that, you will have the confidence you need without tricking your own mind. Obviously this also assumes that you have the ability (either mental or physical) and temperament to do all the things they were capable of doing. The simplest explanation I’ve heard for this is Do x Be = Have. Read my blog explaining that formula. That’s pretty much it. Sounds a bit too simple doesn’t it? No memorization, no daily recitations, no lists of positive self qualities. Though it is simple, if that sounds easy to you, you misunderstood what I said. If you want to be as wealthy as Bill Gates, you have to know and do all of the things that Bill Gates knows and does (and be lucky enough to have the timing and potential that he does). That’s not easy. If you want to simply be a millionaire, find a few who you’d like to emulate and learn everything they know and do. Unfortunately, this is a lot MORE work than the self help guru’s would lead you to believe. Fortunately, this will actually work. How do I know? I’m working through it with my businesses every day. You don’t have to believe me. Let me know how those daily affirmations work out, though. I beg to disagree, in part. But let me first congratulate you on your blogs. Some of them are really terrific, such as the one about the 2 types of employees (I do recognize myself ENTIRELY in one of them – guess which one!). I’m looking forward to more of your writing. Especially a look on your ventures, if you think you can afford to do that. Why? I’d love to learn from a guy with the same entrepreneurial interests (not to mention same age and education) who’s doing what I want to do one day (build a business). So I said I disagreed. To some extent, yes. To me, the law of attraction makes sense in that it visualizations keep the fire in you alive and hence makes you focus (obsess), put in effort, see and grasp opportunities. It’s not hard too see how each of the successful people you mentioned might have applied that themselves. Likely they hadn’t heard about visualizations or the law of attractions, I just think it’s the natural thing to do whenever you have an ambitious goal. As for the UCLA experiment you mentioned: the outcome shouldn’t be a surprise if you agree with my interpretation of the law of attraction. Visualizing will lead, given enough time (which is not given here!) to a vivid desire to get over the hurdle, which will lead to action (analyzing and solving the problem). Which is exactly what the successful group did. No wonder they won. It’s late at night so I want to keep this short, but I hope my point has come across. Greetings from Belgium! What kind of businesses are you finding good deals on in Belgium? It’s actually through American bloggers like Pavlina that I discovered these self-help theories that are so popular in the US. I never went to the original material (except for a few chapters from Napoleon Hill, mostly on visualizations). I’d read what the blogger said and decided that the value was every time in the visualizations, the focus. What didn’t make sense to me (basically, anything else) I just discarded. I understand that it’s the latter that you’re targeting in this blog, so we’re probably on the same page here. I’m looking forward to your upcoming blog on the topic! “Good deals on businesses in Belgium”: actually I’ve never seriously considered buying a business. I thought: why would I pay a boatload of money for a bakery with limited upside? No, then I’d rather start my own business from scratch. Then I read that you do it and recommend it [buying a business] and then I realized it could be a good idea and some of my assumptions (expensive as in a million bucks, no upside) were wrong. But I’m not at the point yet where I have found good deals. Something I recently learnt though is that family businesses across the board tend to be cheap here, because Belgians excel at writing off personal costs as company costs, which means a lower company profit in the books and the company will sell for less than it would have otherwise. Starting a business is always more expensive because you have no cashflow, no customers, no residual marketing, no name recognition, no products, no procedures, no scripts, no employees… And it costs a lot of time and money to get those things. Generally it’s a lot easier (particularly when you’re getting started) to fix existing businesses that have some of those things but with a little improvement can drastically increase profitability (and therefore value). Keep looking for business and telling everyone you’re looking to buy/run a business. Sometimes you can get ownership through sweat-equity partnerships when you’re starting out but read my blog on partnerships before you go down that path. Best of luck and I look forward to more comments (whether you agree or disagree)! Thanks for the tips, Bryan! Michael Jordan and the Chicago Bulls…you can’t get better than that combination and no-one has come close since! The idea of affirmations is to raise your vibration to set yourself up for positive action and consistency, which we all know is key. Its about energy, what you give out (thoughts) you get back. If you raise your inner frequency by affirming yourself, and do so consistently, you will attract things that match that frequency. For example, if your thinking of yourself as someone on the poverty scale, you can’t possibly attract wealth. Seeing yourself as wealthy and prosperous (even if your reality doesn’t match one of a wealthy person) you are changing your paradigm and restoring your belief system little by little. Or even with our relationships we end up in. Why do most of our relationships start amazing then end up painful? That’s because we attracted those people, through our own energies. An Insecure person can’t attract confident people, but that’s also the beauty in relationships, you will attract an individual that mirrors your personality , in positive traits AND the negative traits. In other words, if my spouse says something that makes me mad, chances are it is something that is challenging my belief system or the frustration stems from a negative trait in me and I was simply reflecting from them. There’s a reason gurus are the ones teaching this, because they know how to implement self healing with growth. Its the difference of going into something with doubts in your mind, and going into it believing in yourself. I see your side here, that action is necessary. Maybe there will be a new form of teaching implementing the importance of the action step too. Maybe that is something I can learn to do myself even! I’m sure if I doubted myself due to the fact that I don’t have a teaching degree, I probably would never try..
**Things aren’t always the way they appear to be. Instead of waking up telling yourself your already tired, or you don’t want to go to work, etc etc. It takes 21 days to fully form a new belief in your subconscious. Its all the same at the core, just different ways of looking at it, with different levels of open mindedness. Hi Touria, Have you read the book by Noah St. John linked in the blog? There’s a better option that is more inline with what we now understand about psychology and neuroscience and that’s “afformations” in the form of questions. In other words, we’re agreeing in a lot of ways, I’m just suggesting there’s a more effective way to achieve the benefits than mantras. A better option than false statements of belief are habits. If you tell yourself you’re poor, indeed you are. But if you start automatically putting 10% out of every pay into a separate account for investing, you indeed are becoming rich and you have a rich habit. Physical health is paramount and just like when you start working out it’s really hard, once you get to a certain level of fitness it’s extremely hard to STOP working out. So if I’m 100 pounds overweight it’s silly to tell myself, “I’m healthy” and lie. Instead I start a habit of working out regularly, cutting out excess sugars, and tracking my weight daily. I may not be “healthy” yet but I can now gain confidence in starting healthy habits and watching my health improve. Focus on the good habits to generate the confidence. That will get you much further than affirmations.